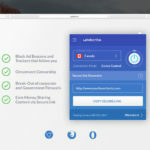 Earlier this month, we told you about the $25 off discount off $100 purchases on Costco.ca, if you checkout with Mastercard’s Masterpass. The discount can be applied to any purchase $100 or more, so many of you jumped on the 32GB Apple TV 4K for $194.99. Now, the 64GB version of the Apple TV 4K is available online, listed at $234.99. But after the $25 Masterpass discount is applied, the final price drops to $209.99, which saves you $39.01 off Apple’s price of $249, or savings of 16%. Not bad for a new Apple product released last month. 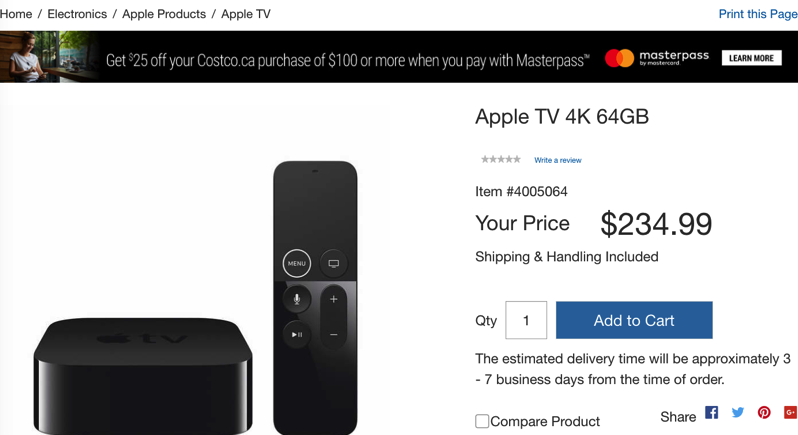 Costco.ca says the 64GB Apple TV 4K is shipping in 3 to 7 business days, which is much faster than Apple.ca, where online orders are showing 4-5 weeks for shipping. If you purchased a 32GB Apple TV 4K earlier, you can easily return it and get the 64GB version instead, if that’s what you were hoping for (thanks to Costco’s 90 day return policy on electronics). Let us know if you’re going to jump on this.